The scope, frequency, ease of use and remarkable value of Hong Kong’s bus services make it an excellent and enjoyable way to explore and travel beyond the normal tourist “hotspots”. Hong Kong has some outstanding and fascinating urban and rural scenery and here are some suggested journeys for visitors. Unless otherwise stated buses on these routes are double deckers and for best views always try and travel on the top deck. The bus journey to the Peak is a scenic alternative to the Peak Tram and provides some exhilarating panoramic views along the journey both during daytime and night time. For best views sit on the right hand side of the bus. The service operates from outside Central Ferry Pier 5 (Cheung Chau Ferry Pier), next stop outside Central Ferry Pier 6 (next to Star Ferry Pier) before travelling along Connaught Road Central past City Hall, through Admiralty District and Queens Road, Wan Chai before starting the twisting climb up to the Peak at Stubbs Road. As the bus ascends there are firstly outstanding views across Happy Valley and then further up at Wan Chai Gap spectacular views of the north side of HK Island, Victoria Harbour and Kowloon beyond. Along Stubbs Road is a popular viewpoint above Lovers Rock, a particularly good spot for photography and passengers can interrupt the journey by leaving the bus here and continuing the journey on a later bus. Just a short walk further uphill past this viewpoint just off Stubbs Road on Coombe Road is the Police Museum. After the joining Peak Road most buses take a short diversion along Guildford Road and Mansfield before rejoining Peak Road and continuing to the bus terminus underneath the Peak Galleria. The journey time is about 40 minutes although frequent road works and slope works can cause delays. Services are operated by Citybus daily from 10am until just after midnight at a frequency of between 7 and 15 minutes depending on day and time. Between 6-15am and 9-50am the service starts at Exchange Square Bus Station instead of Central Ferry Piers. Stanley on the south side of Hong Kong Island is a popular destination for visitors to Hong Kong. Its attractions include the popular Stanley Market (a day market), two fine beaches (Stanley Main Beach and St Stephens Beach on either side of the peninsula), Old Stanley Police Station, Murray House (an impressive old colonial building originally located in Central but dismantled and re-erected here in 2001), the immaculately maintained Stanley Military Cemetery and Stanley Plaza with its shops, restaurants and entertainment amphitheatre. There are four bus services to Stanley from Exchange Square 6, 6A (peak hours only), 6X, 260 (Stanley Express) and 66 (Mon - Fri peak hours only). The 6A, 6X and 260 pass through the Aberdeen Tunnel and do provide scenic views of Repulse Bay and parts of the south HK Island coast. 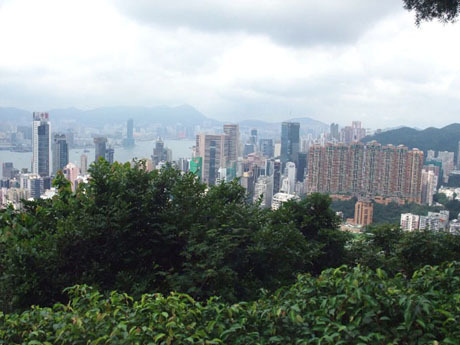 Route 6 and 66 however climbs up and over the hills of central Hong Kong Island providing outstanding views before joining the other routes at Repulse Bay. The route starts at the bus station underneath Exchange Square and follows the route of the number 15 (see above) service through Wan Chai and along the lower part of Stubbs Road. As the route begins its incline there are excellent views down over Happy Valley and the racetrack and the bus shortly leaves Stubbs Road to climb up Wong Nai Chung Road to Hong Kong Parkview, a rather incongruous and ugly residential development along the path of the Hong Kong Trail. At Wong Nai Chung Gap the journey reaches its highest point and soon there are panoramic views across the south side of the island with Deepwater Bay and Repulse Bay down below. The road skirts the edge of Tai Tam Country Park as it descends to join the coast road at Repulse Bay. From Repulse Bay to Stanley the bus climbs and descends along the narrow twisting road before finally descending to Stanley Village. Leave the bus at Stanley Village Bus Terminus (many buses continues to Stanley Prison). Journey time is about 50 minutes. Services of route 6 are operated by Citybus daily from 6am until after midnight at intervals of between 8 and 20 minutes. This bus ride from the colourful coastal town of Sai Kung in the New Territories provides an opportunity to travel on restricted access roads through a country park and explore some of the most tranquil and beautiful scenery in Hong Kong. 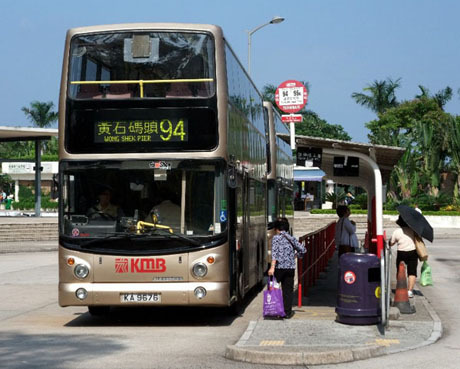 Take the MTR to Diamond Hill Station and then then KMB bus number 92 from the bus terminus below the station. Journey time Diamond Hill to Sai Kung is about 40 minutes. Frequency is between 8 and 20 minutes from 6am to 11pm daily. The main bus terminus and green minibus terminus at Sai Kung are adjacent and almost right alongside the waterfront. The No 94 KMB bus runs every day at 30 minute intervals from 6-30am to 9pm. Most journeys on this route are operated by double-deck buses although occasionally a single deck bus is also utilised. The journey begins travelling north and skirting Sai Kung Bay to the roundabout at the junction with Sai Sha Road (the route to Sha Tin) and continues forward into the Sai Kung East Country Park. Here the road hugs the coastline and you get good views of the beautiful scenery with numerous mostly uninhabited islands set in the tranquil waters of Sai Kung Bay and the green hills of the Sai Kung West Country Park close by on the left side of the bus. The bus meanders its way along the coast road almost all the way to Pak Tam Chung where there is a holiday camp and country park visitor centre and this is also a popular spot for barbecues. The road beyond Pak Tam Chung is restricted to authorised vehicles only and the entry barrier is lifted to allow the bus through. Shortly the bus will turn off to the left (the road ahead leads to the huge High Island Reservoir) and passes close to the Lady MacLehose Holiday Village which is a residential and day recreational centre named after the wife of a former governor of Hong Kong. The road twists and turns and climbs between steep sided forested hills with waterfalls and occasionally cattle straying on to the road before reaching Pak Tam Au where there is a rest area and barbecue area. From Pak Tam Au the bus gradually starts its descent to Wong Shek and breathtaking views of the bays and surrounding hills appear before the bus finally arrives at Wong Shek Pier. The journey time from Sai Kung to Wong Shek Pier is about 30 minutes. Next to the bus terminus is a picnic and barbecue area where you can relax and enjoy the scenery. The area is usually very quiet and peaceful on weekdays although parties of schoolchildren do sometimes frequent the barbecue area. The pier is served by ferry services to several islands and coastal villages around the country park and it’s common to see supplies being loaded and unloaded and locals using the connecting bus services to visit Sai Kung, the nearest town. A major reconstruction and modernisation of the pier was completed in early 2007 and a second public pier, Sai Kung New Public Pier opened in 2009. Apart from small fishing boats the bay is often colourfully occupied by lots of sailing dinghies and canoes from The Jockey Club Watersports Centre which is right next to the barbecue area. There is a refreshment kiosk at the centre although the weekday opening times seem a bit hit and miss. This is also a popular area for both casual walking and more serious hiking. There is a family walk and a tree walk (the routes are indicated on information boards) and its well worth taking the opportunity to use these to explore the area a little further. The higher you get the better the views are. Although Pak Tam Au and Pak Tam Chung are more popular starting and finishing points for hikes there are paths from Wong Shek which soon connect to the MacLehose Trail and lead to Hong Kong’s most beautiful beaches at Tai Long Wan.